TopGame have launched a new 5-reel, 25-line video slot – Great Reef is LIVE! Great Reef was inspired from the world`s largest coral reef, abundant of marine life. The video slot introduces spectacular vivid characters on 25 paylines, providing an outstanding underwater experience for players. Great Reef`s impressive coral gardens gathers a wide range of inhabitants: tropical fish, sea turtles, sea stars, sea horses and the great Sharky. The game reveals special features such as the Pearl Hunter Bonus Game, where players can win up to 33 free spins and a 6x multiplier. 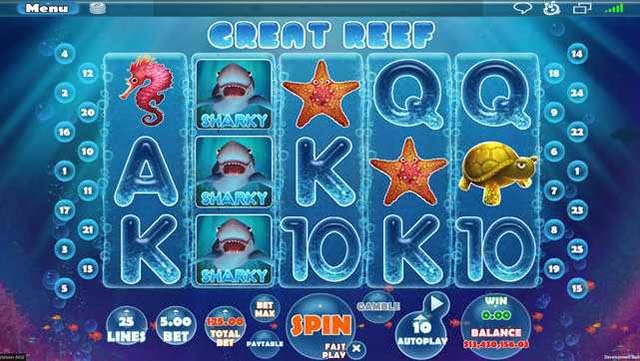 Great Reef :: You can try this NEW Slot game right now at the following casinos (US Players Welcome! ): Rich Casino, Box24 Casino, Black Diamond Casino and Spartan Slots Casino.